Well I cannot say that this recipe is really healthy but it is really yummy! Many of you will remember it as the meal Kyle was eating as he was running from winning the pole for the Texas Cup race to the Nationwide race where he won that night! First, start boiling water for your pasta and toss it in when it’s ready. 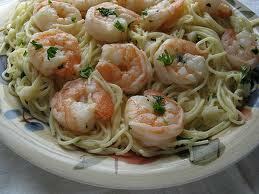 I just had regular on the motorhome but I really like this recipe with angel hair pasta. I also like to leave them el dente (a touch harder then fully cooked). Next, in a big pan heat oil then add minced garlic, sea salt, ground black pepper and red pepper flakes. Toss in chopped up red and yellow peppers let them cook down a bit then toss in the shrimp. You can use fresh but we only had frozen so I ran them under hot water til they thawed out then cut off the tails. Then I toss in a few splashes of white cooking wine, a little butter and some fresh lemon juice. Next, drain the pasta but save about a cup of the water from the pasta. Toss the water into the big pan and sprinkle in some flour to thicken the sauce up. Then add the pasta and toss it all together. We didn’t have it but fresh parsley tastes great in here and also a little lemon zest (just a touch). You can also add a little Parmesan cheese if you want. I’m Italian so Parmesan cheese goes on everything!